Cake for breakfast is an important part of my day. Many mornings it actually saves my sanity. I mean, I know everyone is drinking those green juice things, and while I drink those too, on occasion, I really have found that cake in the morning is better for my health. Especially chocolate cake with peanut butter cups. And when you call a cake “coffee cake”, it’s perfectly acceptable to enjoy pre-10am. The universe says so. I mean, I didn’t invent coffee cake. I just follow along with the masses. Peanut Butter Cup Chocolate Coffee Cake. 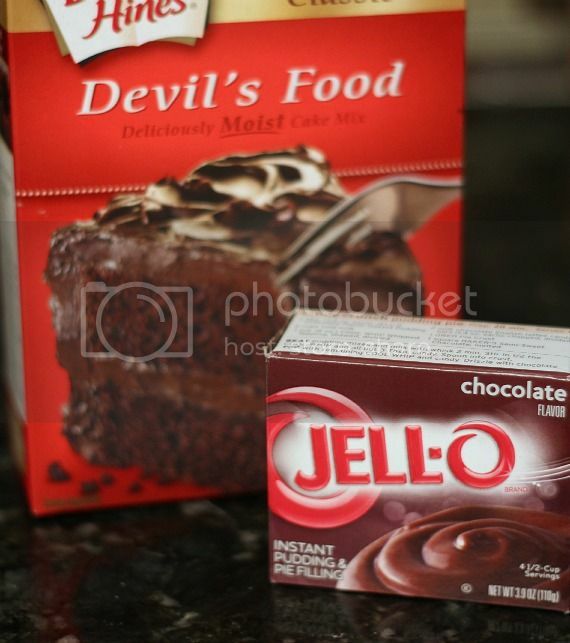 And also you use Devil’s Food Cake mix and pudding. There is no way that this could be bad. The batter is ridiculous. Stupid good. Don’t forget about your peanut butter cups. Like that’s possible. 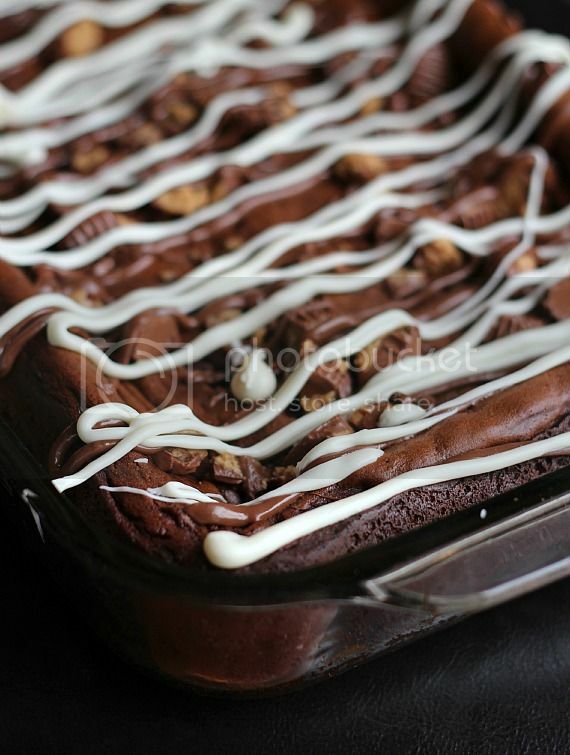 Then, to make it extra pretty, melt some white chocolate and drizzle that all over the toppity top. Also, eating with a mini fork is bound to enhance your coffee cake experience. 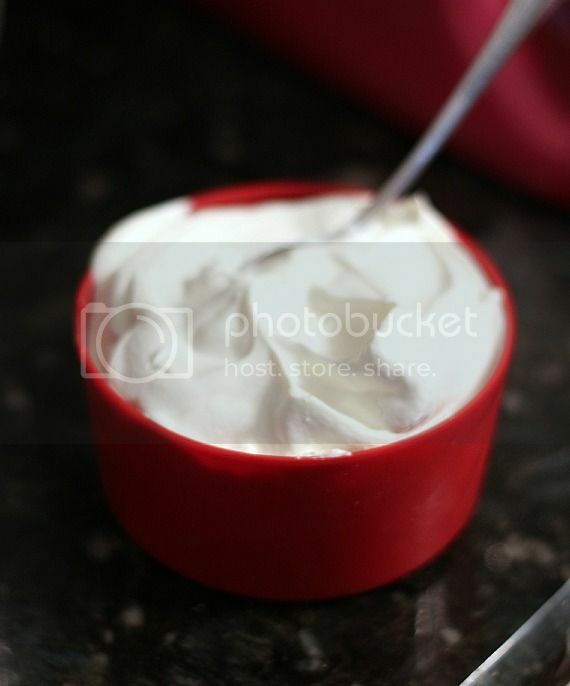 In stand mixer beat sour cream and butter together, add cake mix, dry pudding mix and eggs. Beat at medium speed for about 2 minutes. 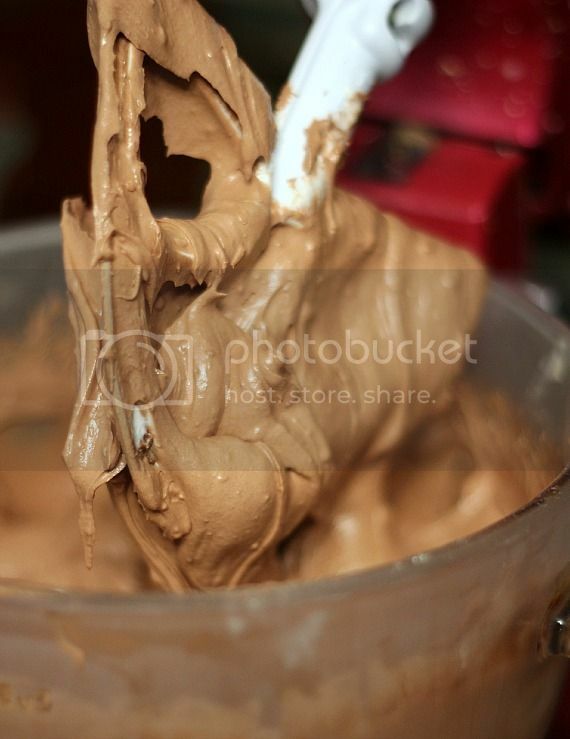 Turn mixer to low and add in semi-sweet chocolate chips. 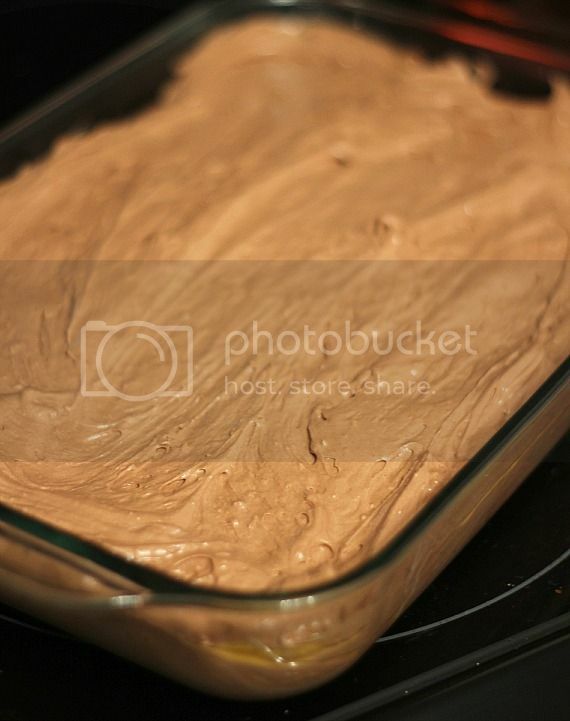 Spread batter in prepared pan and bake approx 30 minutes until center is set and a toothpick comes out clean. Sprinkle chopped peanut butter cups evenly on top of cake. 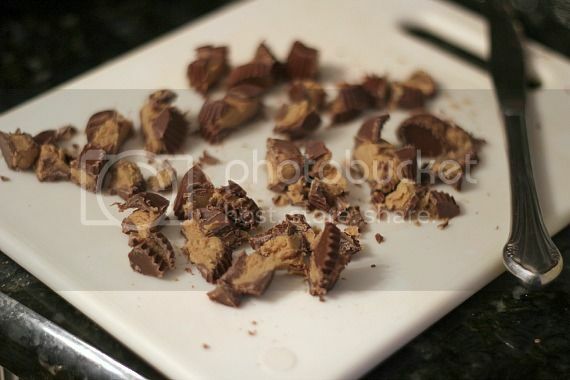 Melt white chips in microwave or over a double boiler and drizzle on top of cake and peanut butter cups. Let cake cool and cut into squares when ready to serve. I melted my white chocolate chips in a ziplock bag in the microwave and snipped off the end and squeezed the white chocolate on my cake. Makes for easy clean up! This cake is even better the next day. Valentine’s Week Round Up & a Video! Very clever of you to call this a coffee cake—I’m all for cake in the morning, and I agree with you, I think it’s healthier that way! Shelly this looks insanely decadent and I would love a slice! 2 sticks of butter, 2 cups of sour cream, and all those PB Cups, and white/dark choc chips….I can’t even imagine how rich this must be! I like the way you think! I am not sure that this is actually even legal to eat for breakfast, but I’m willing to risk it. I’m with you…if it has the word coffee in it, it’s totally breakfasty! Mocha too. I need you in my house, pronto. Cake needs to happen here before 10 AM and be seriously condoned–I like how you think, girl! This breakfast looks totally delectable and legit. So what you’re saying is….I’m allowed to have candy for breakfast. Yes, I knew I made you President for a reason. YES,YES,YES! Love this! Can’t wait to try! You are a genius. I think if people had candy and cake for breakfast there would be a lot less grouchy people in the world. Amen. Love this!! I need this now!! 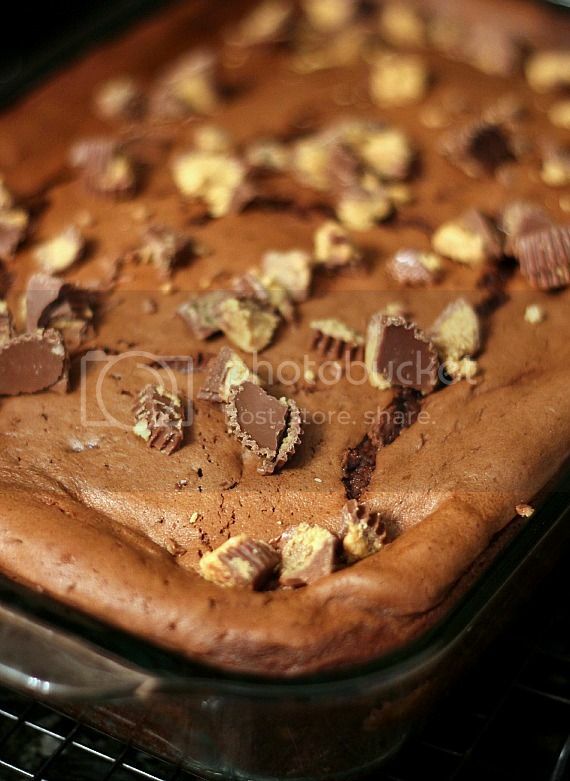 You could easily omit the peanut butter cups, and sprinkle with more chocolate chips and drizzle with peanut butter. Just heat the peanut butter up a bit and drizzle that with the white chocolate. I bet that would look pretty and taste great! Do they make peanut butter pudding? If so I would like to try that mixed in here. By sample a “respectable amount of batter” do you mean a full cup? What? The batter is the best part. Raw egg, shmaw egg. Oh yeah, this would definitely start the day off better! not believing it. it looks like a dressed up brownie. get back to me when you have a peanut butter cup chocolate coffee cake. I tried that on my first attempt at this and even though the batter is thick, they all sink to the bottom and kind of burn. There is a very funny old Bill Cosby video on youtube – “Dad is great. He gives us chocolate cake.” He is feeding his kids weekend breakfast. They convince him to give them cake, then sell him out when their mother shows up. You’re so amazing! Everything you come up with is even better than the last cake, cookie, etc. I can’t wait to make this! Totally believing this, girl! 😉 What a great recipe! I’m guessing you’re the type that eats cold pizza in the morning too?!?!?!! What’s wrong with cold pizza in the morning??? I can’t wait to try this(like tomorrow morning). Actually the authorities on this subject say that eating your sweets early in the day(like breakfast) help you to lose weight because you don’t crave them so much through the day. Who knew!! Love the tip to eat desserts in the morning! I’m convinced! Pizza in the morning….so good! You are hysterical! Just love your writing…and the coffee cake before 10am doesn’t hurt either!! absolutely making this cake for breakfast! Oh I am all about Chocolate Cake for breakfast! Looks wonderful! my love of coffee cake now with pb. This looks amazing! Have all the ingredients and just one question before making it….do you sprinkle the pb cups on the top while the cake is still hot? MADE THIS TODAY. AFTER 30 MINUTES AT 350, THE CENTER WAS STILL VERY “JIGGLY” SO. LEFT IT IS FOR ANOTHER 20 MINUTES. STILL “JIGGLY” SO GAVE IT ANOTHER 20 MINUTES, HAVEN’T LOOKED AT IT SINCE BUT HAD TO TAKE IT OUT SINCE EDGES WERE GETTING OVER COOKED. HAVE NEVER HAD A PROBLEM WITH MY OVEN TEMP. HAVE TO CHECK AGAIN. ONLY OTHER THING IS THAT I NOTICE THAT I USED “LIGHT” SOUR CREAM. JUST STOLE A TASTE OF THE CENTER—FANTASTIC BUT STILL NOT COOKED. WHAT THE HECK HAVE I DONE. MISCOUNT THE EGGS? So weird! The center should be *just set…but definitely not raw! made this yummy cake, took longer to bake about an hour probably my oven . Sure it will be a hit. The coffe cake cookies were a hit with grandchildren and inlaws.